Notes: The show's title comes from an Okinawan stir fry dish called "chanpuru", a mash-up of vegetables, tofu, and whatever type of meat or fish is available at the present. The title thus alludes to the series' stated goal of mixing the worlds of 18th century Japan and 20th century hip-hop culture. In a colorful version of Edo-era Japan that may or may not have existed (let's lean towards not), a pair of highly-skilled samurai, the violent and crazed Mugen and the calculated and serene Jin, join a ditzy young girl named Fuu on a journey to find a mysterious man, butting heads and scraping up a meager survival as they wander through a countryside populated by as many graffiti artists as block painters and where a rival swordsman is quite likely to taunt one with "colorful" 20th century language. Can pointlessness ruin a story? And must a television show have an ultimate goal to be compelling? It's hard to answer these questions, especially in an age where the popularity of episodic sitcoms is on the rise and the formerly dominant serials and dramas are struggling to stay afloat. In the past decade, anime has experienced the same upheaval, and many of the most popular anime series of late have been so-called "slice of life" shows with virtually no unifying plot and, in some cases, no commitment to continuity. One might ask whether the tendency to literally "lose the point" is bad, but whatever the case, I've seen plenty of good sitcom-style series, and I have to admit that it's sometimes quite refreshing to see anime stop taking itself seriously. We get a crisis, however, when a show does present us with a central story and then spends almost no time developing it, leaving us with a half-formed idea entirely smothered by diversions and distractions. This turned out to be the problem at the core of Samurai Champloo, an entertaining but flawed pastiche of Edo-era Japan that is brought down by over-the-top antics and commitments that the series unfortunately never quite fulfills. Samurai Champloo comes to us courtesy of Shinichiro Watanabe, a director famous for his close joining of setting to a given era's musical culture, and in this case he presents us with an anachronistic fusion of 20th century hip-hop music, a quintessential anti-establishment genre, and 18th century Japan, where the once-unshakable structures of the samurai and the shogunate were just beginning to totter. But while Watanabe may have advertised the show as a seamless fusion, the touches are in fact few and far between, which is a pity considering that the ones he does include hit the mark quite well. For example, we get a hilarious episode depicting "tagger" culture as an offshoot of a dojo, and in the first episode a record "scratches" through time, stopping briefly in the 20th century for comic effect. Aside from the sometimes-seen presence of boom-boxes and shorts, however, (along with some "colorful" language that is quite entertaining at times), there really isn't much else. I was disappointed by how little the show seemed to try, and even when the pastiches worked perfectly I only came away wishing that the show had given me more of them. What frustrated me most about Samurai Champloo, however, was that it spent almost no time on its purported "story", for aside from the occasional flashback or secondary account, we learn very little about this "Sunflower Samurai" for a very, very long time. In what is the show's most damaging mistake, the action never brings us any closer to him, nor, for that matter, does it give us much indication of who he is until the last quarter of the show. After a while, as the show seems to lose sight of its purpose, it begins to feel like an excuse to have sword fights, and indeed, if the show gives us nothing else, it gives us lots and lots of bloody, bloody, bloody combat. I'm not squeamish, but I have to admit that I found the amount of violence in this show to be a bit gratuitous, for while we at least never see organs flying or bones being pulled out, we do get a virtually endless river of blood. While I originally enjoyed Mugen and Jin's fighting, finding their charismatic style to be quite impressive, after a point, when the two had slaughtered an army and come away unharmed for the umpteenth time, I became somewhat disturbed. I will also say that I was bothered whenever the show ended an episode with a violent death and then began the next episode with the trio traveling on their merry way, and while, on a cultural level, it may make sense for a samurai to be detached from his kill, I personally found this detachment to be a bit too nihilistic for my taste. The show is, frankly, also way too ridiculous for its own good, and while it makes the smart move of performing an onscreen disavowal of any claim to accuracy, this move does make it puzzling as to why it insists on tackling historical subjects with the degree of seriousness it attempts. 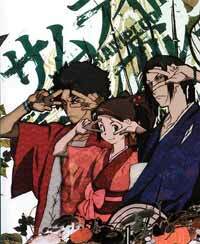 Samurai Champloo is too sedate to be a parody but too devoid of substance to be an analytical examination, and when the show half-jokingly examines subjects such as the persecution of Christians and Japan's economic isolation, it becomes a boring and confusing mess. The results are utterly embarrassing at times, particularly during a "baseball" episode that is so filled with cheese, bad-execution, morbid but unfunny jokes, and stereotypes that it made me want to abandon this series (and the fact that this followed an abysmal episode involving zombies ... yes, I am serious, zombies ... did not help in the slightest). And as if the show doesn't already feel off-kilter, Samurai Champloo makes the mistake of giving us a smattering of weak two and three-part arcs in the midst of its episodic plots. These arcs typically give us a new character, knead a reasonable (if none-too remarkable) story around them, and then expect us to care about the events that play out, which usually involve some half-baked tragic elements and plenty of violence from our Samurai friends. While I may have faulted the show for being too episodic, it was, ironically, these multi-episode stories that really grated on me the most. They move too fast and have too little subtlety for me to take them seriously, and they unfortunately feel like poor apologies for the people originally drawn in by the promise of a solid plot. While I found one of them, a story about warring clans, to be quite entertaining, the others proved to be irritating, and my enjoyment was generally not helped by the presence of equally annoying characters and a complete lack of satisfying resolution. Placing dramatic weight on these stories was a poor choice on Watanabe's part, and they just don't hold up to that weight at all. But while I may complain about this show, I won't call it a total loss or even a great loss at all, for there were still some things I loved about it. The main trio works quite well as a set of comic foils, and even in the most abysmal episodes I often found myself laughing at the interplay between them. On top of everything, Jin is quite compelling as a character, and his backstory as an exiled swordsman ("ronin") suits his lonely and stoic personality perfectly. At times, he feels like the only person in the show with much of a conscience or a believable personality, and he is the only one who undergoes any noticeable revelations; I must say that I enjoyed almost every episode that focused on him. And while Fuu is a little too ditzy for my tastes, she's funny and intelligent enough to make me feel some warmth for her, and the jokes centering around her and her voracious appetite are some of the show's very best. I can't say the same about Mugen, sadly, and I don't think that the show ever really takes him out of being the violent, angry, and borderline-psychopathic "berserker" archtype. His snarling voice and his endless taunts and obscenities become quite grating by the end, and he, in truth, is the one weak link in a show that otherwise had strong characterization. The show is, all around, also quite impressive in terms of technical achievements, and I was particularly pleased by the musical score. The background music, a mishmash of light beats and appropriately atmospheric keyboards, suits the show perfectly, and the opening and ending themes (which are both accompanied by beautiful art) completely hit the mark in terms of the show's intended style. In particular, the ending theme, a spunky but soulful minor-key tune, was perfect for ending a viewing and, at times, forgetting about the show's more irritating moments. The animation is also solid, and I appreciated the touches of Edo-era art, especially the woodblock prints in the opening sequenece. However, the backgrounds are surprisingly dull (if reasonably detailed), and while the main characters have excellent designs, almost everyone else is unbelievably ugly. And while I won't fault people for wanting to make fun of Americans, I do have to say that none of us are anywhere near as grotesque as this show makes us out to be. I have to admit that my opinion of this series suffers from the fact that it feels depressingly inferior to Watanabe's other work, and I believe that it completely fails in its stated goal of being the first "hip-hop" driven anime. It certainly won't be the next stepping-stone in anime storytelling (as some critics make it out to be), and it's way too inconsistent, devoid of drive, and off-kilter to be taken too seriously. But having been entertained and brought to laughter a good amount, I don't feel like my time was wasted. Samurai Champloo is not a bad show; it's just little more than an enjoyable but pointless romp that doesn't hold up to the high expectations I originally had for it. Recommended Audience: Gore, foul language, and bawdiness run rampant in this show. This is not a show for children, and it is best for older teens and above.